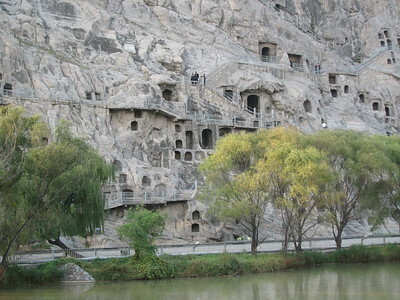 The Longmen Grottoes are caves with Buddhist carving, dating from the end of the 5th century to the mid 8th century. The grottoes are dotted on either side of the river Yi. The carvings were developed when Emperor Xianwen moved the Northern Wei capital to Luoyang in 493. Cave temples like this, which are replicas of temples on the ground, originate in India. Its most prominent examples there are the Ajanta and Ellora Caves. The concept came to China together with the spread of Buddhism via the Silk Route. The Longmen Grottoes are located about 15 kilometers south of Luoyang. I arrived there by taxi in the late afternoon. There's a large sign just past the entrance that it is forbidden to take pictures, except "for personal souvenir". The Chinese were happily snapping away though, so after some hesitation I did the same. The many sculptures are well visible within their caves. Most of them have their heads smashed, a result of the Cultural Revolution. The two highlights for me were the Wanfo Cave and the Binyang Cave. The Wanfo Cave is were 15,000 small statues of Buddha are chiseled in the walls of the cave. Binyang is the biggest area, where the huge statues are almost out in the open. Across the bridge, on the East Hill, there are more grottoes. I found these less spectacular than the ones on the West Hill. It is worth to get over anyway because there's a great overview over all the caves on the other side. The enormity of it all becomes much clearer then. It is tempting of course to compare these carvings to the ones I saw earlier this trip in Dazu. The Longmen Grottoes are from a much earlier period however. They lack the colouring and the details of social life that characterize Dazu. The interest of the Longmen Grottoes lies in the size of the area and the multitude of Buddhist carvings that are present. After a long bus journey from Luoyang train station, I was at Longmen bus stop without any problems, but the thing I encountered was a large complex of well designed mock up traditional village to serve tourist spending. I had to walk through this fake village with countless shops selling souvenirs you can find everywhere in China for almost 15 minutes, a real exhausted experience from tourism industry. Thankfully that beyond the village was a beautiful and peaceful landscape of riverside garden spanning from the village to the limestone cliffs located both side of the river forming a pretty river valley where ancient Chinese named this area “The Dragon Gate” or Longmen. With the hefty fee of 120 RMB, I went under the arch bridge which cleverly used as an entrance gate engraving Longmen name in traditional Chinese alphabet, a real unique as other Longmen sign in other places using simplified alphabet, a really nice small detail if you know Chinese. After passing tourist information center, the wonderland of hundreds of grottoes was appeared. For over 200 years, artists were busy for craving the striking white limestone to hold thousand of small Buddha statues, a real religious devotion transforming the cliff to be looked like a large emmental cheese. After in-depth admiration, the art of Longmen was divided into two styles – northern Wei style and Tang style. From my perspective, northern Wei Buddhist art was quite strange; a collision of many central and eastern Asian art elements, a face of Buddha was hard to explain as it was unique in its own kind with oval face, the out proportionate body and the larger than usual ears but exquisite cloth line depiction. The best of northern Wei was Three Binyang Cave, with three grottoes and three totally contrast Buddha statues, noted for the right grotto has funny posed Buddha with Churchill’s victory finger. I have to admit that northern Wei was not my favorite or ideal Buddhist art in my humble opinion, but for the Tang groups I really appreciated to see. Tang art was developed after northern Wei and in Longmen could be found in Fengxian Si, a large group of statues with Buddha and guardians. The famous Losana Buddha is one of the iconic images in China believed to be modeled after the face of Empress Wu, the only woman who ruled China by her own right and had been regarded as Mona Lisa of the orient for its beautiful and real life face, not only Losana, the face of the guardians were also wonderful, Tang style had add the expression to the face of the statues, and these made a great contrast to Northern Wei ones, the statues also have unique illusive proportion of head and body, a real great art. After exit, I walked to another side of the river for great view and then used the arch bridge crossing the river, the same one that used as an entrance gate, and back to the tourist village. All in all Longmen was a great place to visit, since this was my only and first Chinese Buddhist cave I saw, so I could not make any comparison to other Chinese cave in WHS list, but if you want to see the zenith of Tang Buddhist art period, Longmen was the place to pay visit and admire the art representing one of the most sophisticated time in Chinese history. Indeed, this is one of the many outstanding Chinese masterpieces, added to over many centuries. It was a most thrilling experience to visit Longmen. My first visit to Mainland China was in 1980, and I have returned on a number of occasions. I served as a "Foreign Expert" teaching English and Western Civilization at the Normal College of Foreign Language in Beijing in 1987-8. The Foreign Experts Bureau was based at my residence hotel, the Friendship Hotel in Beijing. Not only did they 'watch over us', they were there to assist us in many ways. About every third week they organized a weekend visit to historic sites. I visited twenty-one provinces that year, usually for less than US$20 a weekend, everything included. Those were the halcyon days of China before the tragedies of 1989. My visit to Longmen was in May 1988, and there was considerable time to visit the various caves. It was somewhat understanding, though disappointing, to see all of the vendors and to see people climbing among the statues. I understand that the vendors have been removed from the immediate area. That visit has remained one of the highlights of my numerous visits to China. My interest in Chinese architecture developed greatly as a result of these tours, and it led to my extended participation in a co-operative web photo venture on "Asian Historical Architecture." 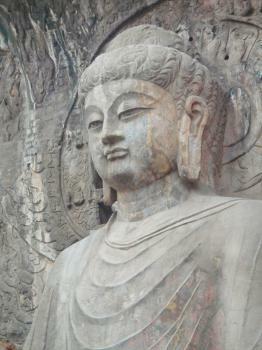 The site includes almost fifty photographs of the Longmen Grottoes, plus a long essay (plus the Yungang Grottoes, and about 10,000 images from many other parts of Asia): http://www.orientalarchitecture.com/ >China>Luoyang>Longmen Grottoes. You may discern in the attached photo, taken outside the Longmen Grottoes, that the majority of the people are wearing blue “Mao suits” – this photo was taken on my first visit to China in May 1978. It is perhaps worth recalling the historical background of the time. In late 1976 Mao Tse-Tung had died and the hard line communist “Gang of Four” had been arrested by Hua Kuo Feng who was still prime minister at the time of our visit. On the other hand Deng Shao-peng was still a “non-person” after proposing supposedly “rightist” views in 1975 (but would re-emerge in the next few months, pay a visit to the USA in Jan 1979 and ultimately replace Hua’s “Soviet planning” approach with more pragmatic economics). China was “on the cusp” as it tentatively moved towards opening up – and the rest as they say “Is History”! The caves are manmade and run alongside a riverside terrace with an external row of giant statues (photo). Inside the caves are buddha/bodhisattva/apsara carvings of all sizes from around 6th/7th centuries – one cave contains an enormous one whose ears alone are 6ft high – another has (reportedly) 10000 tiny carvings covering the walls, blackened shiny over time by fires and the hands of pilgrims. The situation of the caves near Loyang means that they are convenient for anyone travelling to/from Xian overland. If you want to take in only 1 of the WHS “Buddhist carving” caves that probably makes this one the most preferable. Yungang is situated near “dusty Datong” and Mogao in far away Dunhuang. Perhaps the interiors of Yungang are more impressive but no doubt some expert in oriental art will disagree! 4.5: Luke LOU Antonio J.
Blown up: Most of the statues' heads have been destroyed during the Cultural revolution. 125 Community Members have visited.